Here are the gel glue cards I made using Elmer’s blue School Glue Gel (say that 5 times fast!!) 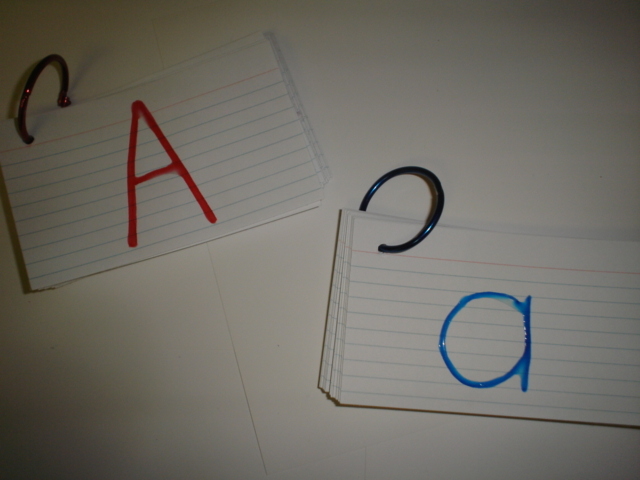 I wrote the letters on index cards using Washable Markers from Crayola and then traced over them with the gel glue. They also have “Galactic Glitter Glue” available in red or blue as well, and when I’m out today, I may grab some of that and see how that works. The Kinder. Kids will use these in the ABC Station and use old crayons and make rubbings. I will have the paper pre-cut for them in various sizes and shapes. I will also make a set for the Word Work Station, writing words instead of letters. I will also make several sets of both words and letters without writing anything with a marker first, so the children will have to guess what the letter is as they rub over it. I’ll be back later with more! Posted on July 20, 2008, in Calendar, Language Arts/Writing, Literacy Work Stations, New Items, Things on Rings, Updates. Bookmark the permalink. Leave a comment.